I'm doing something a little different today for the sixth installment of The Books that Read Us series. This is a book review I wrote for a class last semester on Surprised by Hope by N. T. Wright. For me, it really was a paradigm shifting book and makes perfect sense to include in this series. Enjoy! In Surprised by Hope, N. T. Wright examines the relationship between heaven, the resurrection, and the mission of the church. He begins by examining Biblical evidence for the afterlife, or as he puts it "life after life after death", revealing that many popular beliefs, even in the church, are not Biblical or orthodox. Instead, he presents the Biblical and historical evidence for Jesus’ resurrection and delves into the theological implications for today and the future. At the beginning of chapter one, Wright says this book addresses two closely related questions: 1) What is the ultimate Christian hope? 2) “What hope is there for change, rescue, transformation, new possibilities within the world in the present?” (5). He argues that as long as we see Christian hope in terms of “going to heaven”, where salvation is essentially away from this world, the two questions will not seem related. But if the Christian hope is for God’s new creation, for “new heavens and new earth,” and if that hope has already come to life in Jesus, then the two questions are obviously related, and by answering one, we answer the other. Wright argues that a proper New Testament understanding of heaven is one that focuses on the kingdom of God of which we are already citizens here and now. According to Wright, when Jesus talks about “God’s kingdom” he is not referring to where we go when we die, “but to God’s sovereign rule coming ‘on earth as it is in heaven’” (18). To talk about heaven is to talk about the kingdom of God coming down to earth, setting everything “to rights”. Wright observes that most of the Western world has been heavily influenced by Plato and so has their Christianity. This leaves them with the assumption that the Christian hope is that we leave this world behind when we die and go to heaven. According to Wright, when the Bible mentions heaven, "it is not talking about two localities related to each other within the space-time continuum or about a nonphysical world contrasted with a physical one but about two different kinds of what we call space, two different kinds of what we call matter" (115). Wright says the Platonic misunderstanding of the Bible undermines the mission of the church. If the only thing that matters is going to heaven when we die, there is little motivation for taking care of the current world and the people in it. When Wright was talking about the influence of Plato upon Christianity I was reminded of the article we read for class by Colin Gunton, “The Human Creation. Towards a Renewal of the Doctrine of the Imago Dei”. Throughout the book I was also reminded of Randy Alcorn’s Heaven, and The Great Divorce by C. S. Lewis. In the middle of the book, Wright demonstrates that the overall plan and purpose of God is to redeem, restore, and renew his creation and to reign over it as king. He reiterates that at the end of the Bible, in Revelation, we don’t go up; the New Jerusalem comes down. Jesus will reign over the new heaven and new earth and we will have resurrected bodies. Wright devotes much attention to the word “resurrection” and the way the ancients used the term. He states that “resurrection in its Greek, Latin, or other equivalents was never used to mean life after death … resurrection was used to denote new bodily life after whatever sort of life after death there might be” (36). The final part of Surprised by Hope addresses the mission of the church today. Wright says that the hope of Christians is not only for the future, but also for the present. He suggests practical ways Christians can participate in building for the kingdom of God. As Christians, we get to contribute to the work of the kingdom of God when we act and speak in the world today for the glory of God. Resurrection hope is what fuels us in this endeavor. I do not agree with everything in this book, in particular, I am not sure about the political implications he makes regarding global debt, among other things. But Wright inspires me to reexamine familiar scriptures with fresh eyes and a fresh perspective. He also employs a faithful reading of the Bible as he develops his theology which is a good model for theological reflection. He also accomplishes what he set out to do in answering the two questions about what our Christian hope is and how it is hope for today, not just the future. Everything I have read by N. T. Wright to this point has been helpful in developing my own theological thinking. 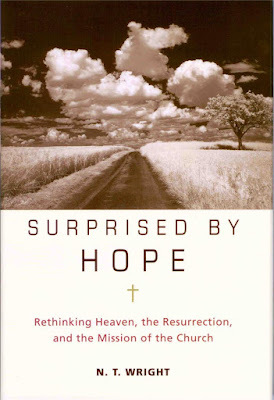 Surprised by Hope is a paradigm shifting kind of book. It re-teaches readers how to think about the kingdom of God and attempts to fix our pop-culture understandings of heaven and hell. I would recommend this book to most people, though it can be dense at times for the average lay person, and not quite scholarly enough at times for academics. Wright has two bodies of work: books written for the general populace and scholarly works where he defends his theology (Jesus and the Victory of God, The Resurrection of the Son of God, etc.) Since Surprised by Hope falls in the first category, Wright frequently starts talking about something in brief, only to explain that he has written another book about that topic that you can read for more information. With a writer as prolific as Wright, this is somewhat understandable, although it can be frustrating. Personally, it makes me want to read everything else he wrote, especially The Resurrection of the Son of God, which he drew on heavily in this book. 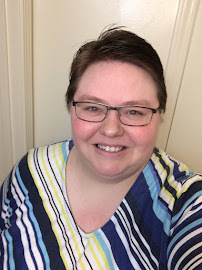 But overall, Surprised by Hope is a great book, both for its biblical and theological exposition of the hope we have, but also for the way it shows the active connection between that hope and our lives today.